Our used Bailey Pegasus 534 is shown below, for more information please contact us. 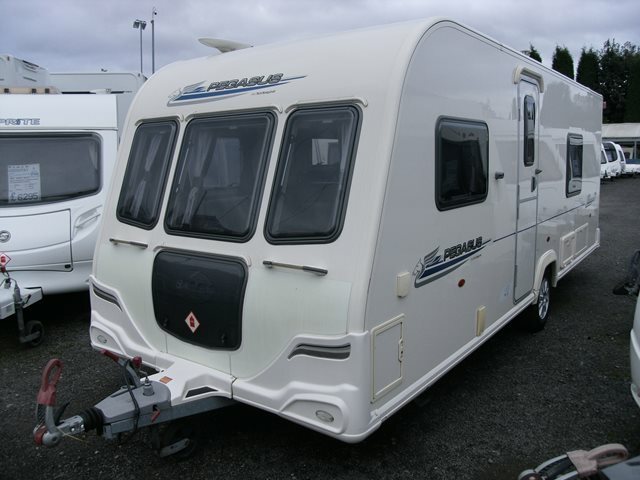 This caravan from Bailey features a hugely popular layout, with fixed bed to the side, an end washroom, central kitchen and bench seats to the front. This 534 is in good condition and is light enough to be towed by a large selection of vehicles. The Pegasus is well finished with a good level of specification including AL-KO ATC, external gas and mains points, CD/radio player, alarm and microwave. The 534 is ideal for a family of up to four people. For more information please contact us on 01384 413336 and ask for the sales team.